Arrive in Paris, the romantic capital of France. Transfer from the Charles de Gaulle airport to your hotel for a 2-night stay. After check-in, enjoy free time to explore this exciting city, or join our “welcome walk” to stretch your legs and get oriented. Today’s tour begins with a drive along the Champs-Élysées, past the Arc de Triomphe to the world-famous Louvre. The remainder of the day is yours to experience more of this timeless city: visit a museum, explore Montmartre or take a moonlit cruise along the Seine River. The banks of the Seine, with their graceful bridges and unrivaled city views, are a UNESCO World Heritage Site. As always, your Program Director can help you plan your free time. Today, visit the Luxembourg American Cemetery and pay homage to the many Americans who lost their lives during the WWII Battle of the Bulge. See the city of Luxembourg on a guided tour, and then continue on to Trier and embark your ship. Dinner is served on board. Enjoy a morning tour of Trier, Germany’s oldest city, set on the banks of the Moselle River. See the wonderfully preserved Roman Porta Nigra, Trier Cathedral and the Church of Our Lady. Lunch is served on board as we depart. 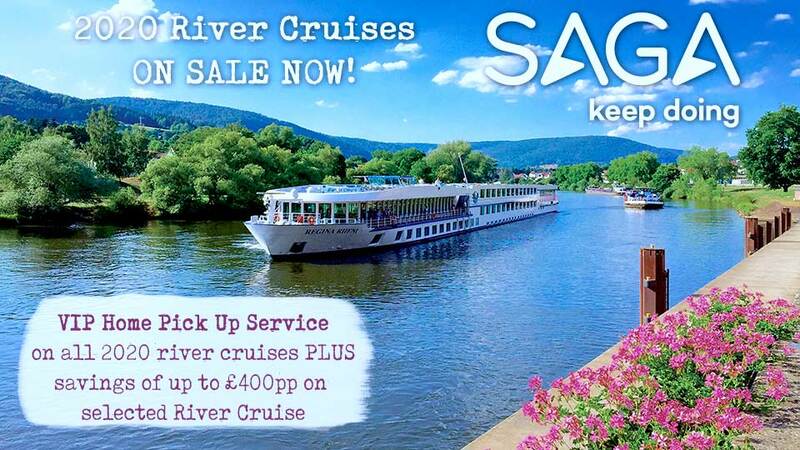 Enjoy scenic cruising along the Moselle this afternoon. We dock in Bernkastel around dinnertime. After your evening meal you can take a walk through the town’s cobblestone streets, or join an optional wine-tasting excursion in this famous wine region. A walking tour takes you through the quaint Moselle town of Cochem. Then, visit imposing Reichsburg Castle. After lunch you sail the scenic Moselle to Winnigen, arriving in the evening during dinner. Explore the cobbled streets and cafés, or stay on your ship and hear folktales about the Moselle. After breakfast, disembark in Koblenz for a tour of Marksburg Castle, the only Rhine fortress that was never destroyed. Since its fortifications have remained so intact, stepping inside is a veritable journey back to the Middle Ages. Take in views of the Rhine Valley from this castle’s stunning vantage point. Meet your ship in Braubach, where it has sailed during your excursion. 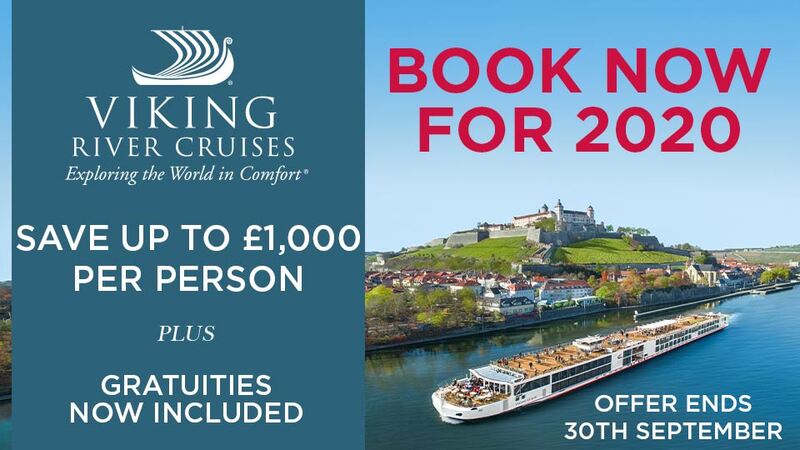 Have lunch and enjoy cruising through the storied Middle Rhine, a UNESCO World Heritage Site, lined with medieval castles, historic towns and vineyards. Today’s full-day excursion takes you to Heidelberg, home to Germany’s oldest university. Tour the imposing red sandstone ruins of Heidelberg Castle, built in the 12th century but twice destroyed by lightning and then later rebuilt. A guided walk through Heidelberg’s Old Town and marketplace is included, as is lunch in a local restaurant. Return to your ship for dinner and departure. Disembark in Karlstadt and take a half-day excursion to the enticing Franconian wine town of Würzburg where you tour the Bishops’ Residenz, a beautiful baroque palace with numerous paintings and frescoes. Enjoy some free time in Würzburg this afternoon, or join an optional journey along the “Romantic Road” to the walled medieval village of Rothenburg. Meet your ship in Würzburg and dine on board. 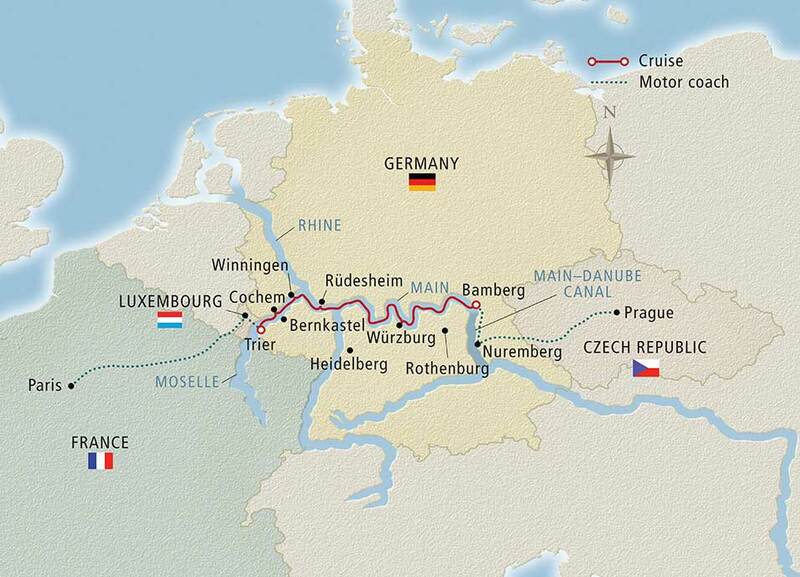 This morning, enjoy scenic cruising along the Main River as you make your way eastward through the Franconia region of Germany. After lunch we stop in the historic town of Bamberg, founded in 902 and an important center of the German Enlightenment. Enjoy a walking tour of Bamberg’s beautifully preserved Old Town area, a UNESCO World Heritage Site, then take time to explore or perhaps sample the town’s famous locally brewed smoky beer, rauchbier. Dine on board. After breakfast, disembark in Bamberg for a tour of the Bavarian city of Nuremberg. See the ruins of Zeppelin Field, Nazi parade grounds of the 1930s, and the Palace of Justice, the venerable vestige of the Nuremberg Trials. Enjoy lunch on your own, then transfer to Prague. Check in to your hotel for a 2-night stay and take time to explore the city and see what you discover. This morning, tour the “City of a Hundred Spires.” A guided walk takes you through Old Town to the famed Charles Bridge. Then, travel to Hradčany for a guided tour inside Prague Castle and St. Vitus Cathedral. Enjoy the rest of the day at leisure; you can see the Town Hall’s intricate 15th-century astronomical clock and spend some time in historic Wenceslas Square. You also have the opportunity today to join an optional tour to Lobkowicz Palace. After breakfast, check out of your hotel and proceed to the airport for your return flight. Or, extend your journey with 2 additional nights in Prague and discover more of this celebrated city.